2006 Chevrolet HHR ALL TYPES. 2007 Chevrolet HHR ALL TYPES. 2011 Chevrolet HHR ALL TYPES. 2008-2010 Chevrolet HHR LS-LS PANEL-LT-LT PANEL. 2005 Chevrolet Cobalt BASE MODEL-LS-LT. 2010 Chevrolet Cobalt BASE MODEL-LS-LT-LT TEAM CANADA. Shock Absorber Assembly. · Including 2xFront Shock Absorbers，2xRear Shock Absorbers. SE Sedan 4-Door. SE Coupe 2-Door. GT Sedan 4-Door. GT Coupe 2-Door. Base Sedan 4-Door. Base Coupe 2-Door. Shock Struts. Clock Spring. · Including 2x Front Shock Struts，2x Rear Shock Absorbers. · One Year Warranty after receiving. SE Sedan 4-Door. SE Coupe 2-Door. GT Sedan 4-Door. GT Coupe 2-Door. Chevrolet HHR 2006 - 2011 EXCLUDING SS MODELS. Chevrolet Cobalt 2005 - 2010 EXCLUDING SS MODELS. 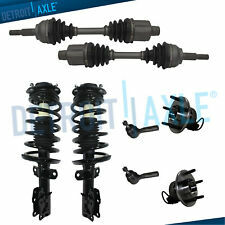 Set of Front Struts and Rear Shock Absorbers (OE: 172179L, 172179R, 5779). Each Complete Strut Assembly is designed and tuned for vehicle specific applications. For 2006-2011 Chevrolet HHR. For 2005-2010 Chevrolet Cobalt. Get high quality car parts here at our website! And it is fully tested to ensure a proper fit and performance. Don't miss out! For 2008-2009 Saturn Astra. 06-11 Chevrolet HHR Front Quick Complete Shock / Strut & Coil Spring Mounts x2. 2006 - 2011 Chevrolet HHR. 2006 CHEVROLET HHR 4 2.2 Wagon FWD. 2006 CHEVROLET HHR 4 2.4 Wagon FWD. 2007 CHEVROLET HHR 4 2.2 Wagon FWD. 2006 - 2011 Chevrolet HHR. 2 Rear Shock Absorbers (As Pictured). 2006 CHEVROLET HHR 4 2.2 Wagon FWD. 2006 CHEVROLET HHR 4 2.4 Wagon FWD. 2007 CHEVROLET HHR 4 2.2 Wagon FWD. 2007 CHEVROLET HHR 4 2.4 Wagon FWD. 2006 - 2011 Chevrolet HHR. 2006 CHEVROLET HHR 4 2.2 Wagon FWD. 2006 CHEVROLET HHR 4 2.4 Wagon FWD. 2007 CHEVROLET HHR 4 2.2 Wagon FWD. 2007 CHEVROLET HHR 4 2.4 Wagon FWD. 2008 CHEVROLET HHR 4 2.2 Wagon FWD. Chevrolet HHR 2006 2010 Exc. SS 2.0L Models. Rear Pair of Shocks (2 Pcs). We carry a wide range of shocks and struts. Every shocks and struts we carry is TS16949 certified. We will replace any parts supplied by us that in our opinion are proven defective. Rear Set Left & Right Shocks Struts Absorber Fits Chevrolet HHR 2006-2010 69587. Full Set Shocks Struts Fits 06-11 Chevrolet HHR 05-10 Cobalt. 2005-2010 Chevrolet CobaltL4 2.2L 2198cc 134cid. 2006-2008 Chevrolet CobaltL4 2.4L 2384cc 145cid. "AC Delco Shock Absorber and Strut Assembly --. Series : AC Delco Professional. Type : Shock Absorber. Notes : 15.9 in. Fully Open Length; 5.26 in. Shock Stroke; 1.81 in. Electrostatic paint withstands rust and wear. There are no special tools required and they are vehicle specific as per application for a direct fit ready to install. Complete with the coil spring and strut mount where required. (2) New Complete Front Struts Left & Right. "Gabriel Shock Absorber and Strut Assembly --. Enjoy safe and quick installation with Gabriel ReadyMount Loaded Struts. GABRIEL READYMOUNT LOADED STRUTS. Series : Gabriel ReadyMount. 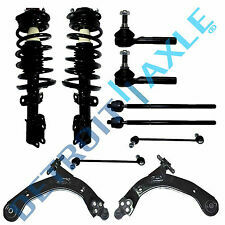 Includes : Upper strut mount, strut bumper, strut boot, coil spring, spring seat, and strut. 2006-2011 Chevrolet HHR. 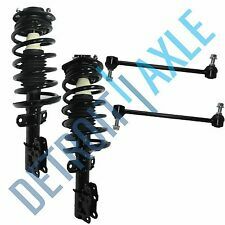 2 Complete Front Struts with Springs and Mounts 2 Rear Shocks. 2005-2010 Chevrolet Cobalt. We carry a wide range of shocks and struts. Every shocks and struts we carry is TS16949 certified. "AC Delco Shock Absorber and Strut Assembly --. Type : Shock Absorber. Notes PERF & HANDLING SUSP(FE5), Front And Rear DISC ANTILOCK BRK(JL9), HVY DUTY ANTILOCK BRAKES(J56), Location : Rear Driver or Passenger Side. 2003-2005 Saturn ION 1 All Models. 2003-2007 Saturn ION 2Excluding Red Line Edition. 2003-2007 Saturn ION 3Excluding Red Line Edition. 2006-2011 Chevrolet HHR. 2 Complete Front Struts with Springs and Mounts. 2005-2010 Chevrolet Cobalt. We will replace any parts supplied by us that in our opinion are proven defective. We carry a wide range of shocks and struts. "AC Delco Shock Absorber and Strut Assembly --. Type : Strut Assembly. Notes With Performance & Handling Suspension(FE5), Location : Front, Driver Side. Location : Left, Front. Condition : New. Manufactured to the highest OE standards, ensuring perfect fit and consistent performance. "Monroe Shock Absorber and Strut Assembly --. Steady your ride with the affordable, all-inclusive design and super-efficient performance of Monroe’s Econo-Matic shock absorbers and strut assemblies. Notes : Kit components - 2 Shock Absorber and Strut Assemblies. "AC Delco Shock Absorber and Strut Assembly --. Type : Strut Assembly. Condition : New. Therefore all implied warranties that may apply to your part are limited to the duration of this written warranty. "AC Delco Shock Absorber and Strut Assembly --. Includes spring, strut, strut cushion and upper strut mount. Type : Loaded strut. Upper mount style : Strut Upper Mount Style. Notes Location : Front, Driver Side. "Gabriel Shock Absorber and Strut Assembly --. GABRIEL – ULTRA SHOCK ABSORBERS AND STRUT ASSEMBLIES. Series : Gabriel Ultra. Type : Strut Assembly. Rod guide and piston seal lessen friction and prevent leaks ". "FCS Shock Absorber and Strut Assembly --. Notes : Kit components - 2 Strut Assemblies; Complete Strut Assembly. 2 Strut Assemblies. Type : Strut Assembly. Notes FWD, Location : Front Driver and Passenger Side. "Gabriel Shock Absorber and Strut Assembly --. GABRIEL READYMOUNT LOADED STRUT SET. Enjoy safe and quick installation with Gabriel ReadyMount Loaded Struts. Series : Gabriel ReadyMount. 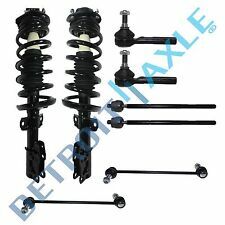 Includes : Upper strut mount, strut bumper, strut boot, coil spring, spring seat, and strut. 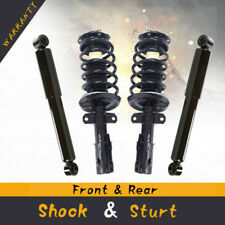 "Monroe Shock Absorber and Strut Assembly --. MONROE – OESPECTRUM PASSENGER CAR SHOCK ABSORBERS AND STRUT ASSEMBLIES. Type : Shock Absorber. Series : Monroe OESpectrum passenger car. Full displaced valving sustains ideal handling and comfort in all driving conditions.